"My stepdad's gonna kill me! It was his ball." "So, some lady signed it." "Okay, Smalls, this is important. What was her name?" "I dunno. Ruth. Baby Ruth." In 1993, Benny "the Jet" Rodriguez got a lesson from his idol. Heroes get remembered, but legends never die. How cool do you have to be to say something like that? As cool as Babe Ruth, the Legend himself. Because our father was and is a huge fan of baseball, my brothers and I grew up knowing all about the Sultan of Swat (and his buddy, my personal favorite, Lou Gehrig). Dad's Murderer's Row t-shirt got passed down as pajamas through all of us, and I'm pretty sure I cried the day it got shredded to be used as cleaning rags. Anyway, even as I admit I could probably fit all that I know about baseball and homerun records on the head of a pin (I was Big Mac's biggest fan during his race... man, was that really eight years ago? ), I understand the ambivalence which fans of America's favorite pasttime are currently feeling toward Barry Bonds. A gentleman on the news tonight really summed it up for me when he said, "[Bonds] was probably the best in the game before he decided to resort to steroids. It's actually kind of sad." And it is sad. Baseball is a game, a sport, a pasttime. It's not life or death. It's not worth cheating to get to the top. 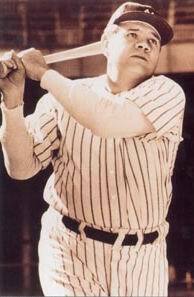 The Babe set the bar and athletes today can't touch it without drugging themselves, bulking up like animals (and I think I can reasonably say that McGuire isn't to be left out of either category). That's what bothers me. Hank Aaron got death threats for being a black man chasing the record... Barry Bonds shoots up and we're all supposed to look the other way. I could watch Field of Dreams over and over again, listening to James Earl Jones speak deep and slow about the best game in our history, smelling the grass, eating the hot dogs. "People will come, Ray. People will most definitely come." Or, Pride of the Yankees... "Today, I consider myself... the luckiest man... on the face of the earth." Or, A League of Their Own... "Are you crying? There's no crying in baseball!" And to me, that's what baseball is, fun and idealism. Something that involves hotdogs and honor and absolutely no crying. My brother, Ted, caught a foul ball at an A's game four years ago... and it remains to be one of our happiest pictures together as a family, Mom, Dad, Ted, Curt and me. I remember the sparkle of the fireworks that night as we all sat on the field and stared straight up, watching the heavens reaching for us. Beautiful. Perfect. Family. So, I wish, I wish, I wish that people (hey Barry, that means you) would think about what the game of baseball meant to people in decades past... and then play accordingly. The incredibly gifted athletes who dominate now might just squeeze a bit more enjoyment out of play time if they were brightening the days and months and Springtimes of happy-go-lucky fans nationwide.